I literally have been working on this post since Monday. I had every intention of getting it published for you all by Wednesday, so you could read it before the next YMCA registration period. Which, by the way, started today at 10 am. Oh, I was also going to remind you of that on my Instagram feed. Guess what? None of that happened. It's now Friday and I am just now getting this published. I didn't get the Instagram reminder out either. Not to mention, that I registered for our YMCA classes on my iPhone as we started a class at the Children's Museum. It must have been a sight - me on my phone trying to corral my son and get him to participate. Then not remembering my username and password, of course. C'est la vie. I like the phrase, "better late than never." Anyway, on to the official post now. No joke, I spend four out of five weekdays at the YMCA. Every morning Monday through Thursday we are there doing some activity or class. Honestly, it is a lifesaver; it allows Caleb get his wiggles out and then I get to interact with other moms/caretakers. Score! We've been in the parent-child swim classes since Caleb was 16 months old. It's been a great experience getting him comfortable in the water and learning a few skills like bubbles and kicks. Given this positive experience, I've been looking forward to having the opportunity to do some of the other classes at the YMCA. At our YMCA, you can begin the parent-child gymnastics when your child turns two. Caleb turned two on January 2nd, which was right before the first session sign-up for 2018. Although he had just barely turned two, we were going to go for it. What the hay, huh?!? I was super excited because we always saw the gymnastics class ending when we arrived at open toddler gym time and it looked like good fun. Plus, I have an active kid and anything that looks like it'll help him get some ya-ya's out is a good thing. My excitement faded a bit and turned slightly fearful when I was scrolling good old Facebook and came across a post from a mom asking if doing gymnastics with a two-year-old was a good idea. There were quite a few comments saying it would be tough since there was too much standing still, direction, and structure. YIKES! However, the handful of comments saying it was fun kept me positive it would turn out okay for us. This past Monday marked the last gymnastics class for this session (oh, if you don't know, the YMCA runs their classes in sessions, which tend to go about six weeks). 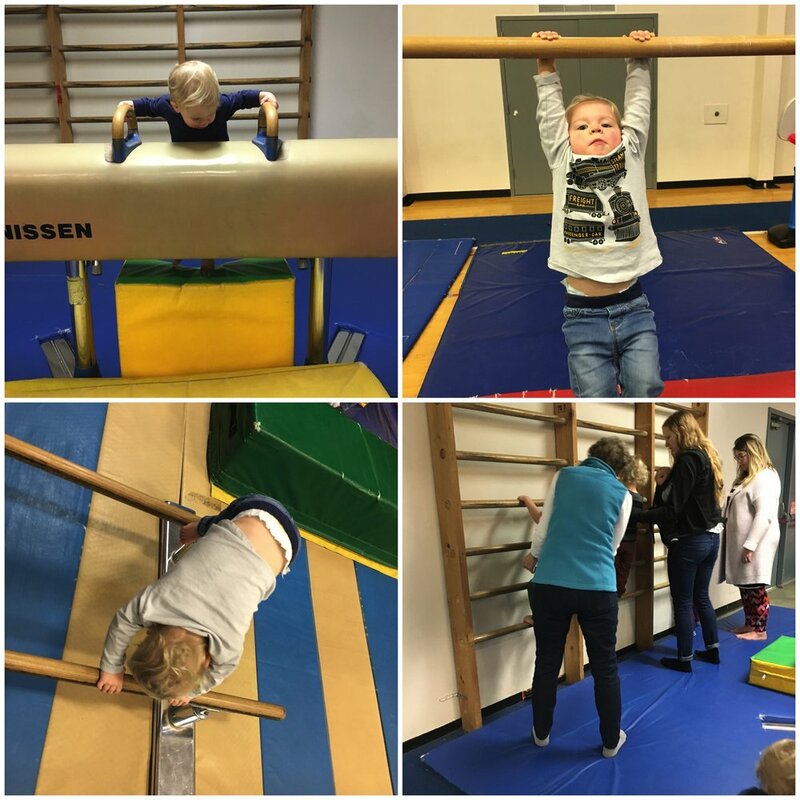 With one session under our belts, I thought I'd give you some insight into what we found fun and what we found challenging with the gymnastics class as a two-year-old. But before we dive in, let me state for the record that we enjoyed it. Oh sure, there were some challenges, but I could tell Caleb enjoyed the activity and I feel like he needs to start learning how to follow instructions somehow somewhere, so why not here? There is a circle time at the beginning and end of the class. The circle time, in the beginning, is trying to get them to stretch. They bring out little carpet squares and have each child/parent sit on it. Then there is a series of stretching. They do try to make it fun for the kids like "make a pizza slice" with your legs and "spider crawl your fingers to your toes." Caleb did like two stretches one class and I was thrilled. The rest of the time he kept trying to sprint off to the trampoline. At the end of class, often the preschool age class joins the parent/child class and they sing a song. It's usually the icky sticky bubblegum song. The only way I can convince my son to stay is if I mention he'll get a stamp at the end. He loves stamps, haha. This sounds funny as a title, but it's true. They go upstairs to the track and have them line up against the wall. The coach try to do a few rules and instructions. The first Caleb had nothing to do with this "stand at the wall" situation. But as we continued classes, he started to do it for a short amount of time. It was a proud mom moment. Luckily, it wasn't for too long and then they got to run bat crazy around the track two times then get water at the water fountain. Of course, Caleb would do three most times. Which actually worked out, and the coach was totally cool with it, since it meant he didn't have to wait in line at the water fountain. Waiting. It's hard for a toddler. There is so much excitement and wanting to do something RIGHT NOW. We get it, it's tough. The most waiting is when they do the circuits of activities. Everyone lines up to do a series of different activities the coaches have lined up. The trick is go immediately to a different activity that's not the "first" one. Let me clarify. The coach will set up a circuit where they (1) go down a slide, (2) hold a low bar and do "horse kicks," (3) do a summersault down a cushion, (4) go between two big cushion blocks and push themselves up, (5) jump on circles, and (6) walk a balance beam. Then have the kids repeat this series a few times. As I was saying, the trick here is to not start with the slide, but head over to another area like the summersault. This makes the line short and waiting less. The only time this trick didn't work was with the trampoline. The coach has the kids sit in a line along the trampoline, then go down one by one on the trampoline. I ended up holding Caleb until it was his turn. However, thinking back now, I don't think the coach would have minded if we skipped the trampoline and went elsewhere first. Maybe next session we'll do that. For Caleb, doing some of the moves they asked was not really possible for his size and capabilities. Like he couldn't jump with two feet together in a zig-zag path down the trampoline. But really, who cares? He would run down and he enjoyed it. He also couldn't walk on the beam and move his foot down and up off the side. But he can walk on the balance beam. This was really no big deal, but it was something I thought I should mention. Will they ever follow directions? I don't think they follow directions until their like in college, right? Just kidding...I hope. The coach does ask the kids to "go here" or "do this." Luckily, if the older kids did it, Caleb generally followed them. As a parent, you'll just need to help guide them. I honestly didn't mean for my challenges list to be so long. I hope it didn't scare you too much. My son is ACTIVE and pretty independent, yet we still managed to have fun. Generally, I felt like I had a workout by the end of the class from chasing him, lifting him, helping him, etc. But his smile made it all worth it. I knew Caleb liked the gymnastics class because the next day we went to open toddler gym time and he started doing some of the activities they taught in the class. He did the monkey crawl thing with the parallel bars (that's not the right name for it, but it's what I think of when I see him do it), walks the balance beams, and holds himself up on the bars. It's cute and warms my heart to see him practicing. As I said before, anything that gets my son moving and grooving is good. He enjoyed the circuits they'd set up and definitely loves the trampoline. If it involves running or climbing, he's happy. Oh, and LOVES to run around the track upstairs now. Who would have thought running around the track was considered fun? Toddlers proving us wrong again. Social interaction for both of us! And I love activities with just slightly older kids involved, as well since Caleb really learns when he watches other kids. That's how we got him to line up along the wall and sit on the line...for a minute. Also, he enjoys playing and interacting with other children; he's a pretty social guy. I also got to talk with other parents, which is always a nice break for me. Who are we kidding? We need to get out of the house especially in the winter. Staying cooped up in the house all day is tough so this is a great way to get out when it's raining or just plain yucky outside. Plus, it's fun. Fun and indoors. Bam! I did talk to a grandma of one of Caleb's friends who happens to be his age. She watches her grandson all week and takes him to all the things. They signed up and didn't even finish the first class. I sure had my doubts after the first class. He was all over the place and I was slightly embarrassed. I talked to the coach afterward about it. She said he did just fine and would likely start to pick things up as we continued. She assured me he always wasn't the worst she'd seen, either. Whew! One of the hard things is that the gymnastics class takes place in the same area as the open toddler gym time, where they just run and play as they wish. To go to a class in that same space after having that freedom takes some adjustment. I think Caleb did eventually figure out we had the class time there and open gym time and they meant different things. I just signed us up again for the next session. Frankly, I don't mind chasing him around and the benefits of it all outweigh the challenges for us. But I can understand (because I've experienced it) how this is hard for two-year-olds. I bet it's only a matter of a few months and it'll get easier. Because one thing I've learned with a toddler. Things change. All. The. Time. Have you taken the class? What do you think? Would you recommend it?